Good afternoon and welcome to this awesome new series of posts we’ll be doing – Seven Days of Doll Play! Each day for seven days we will be posting an awesome play idea for you and your doll! 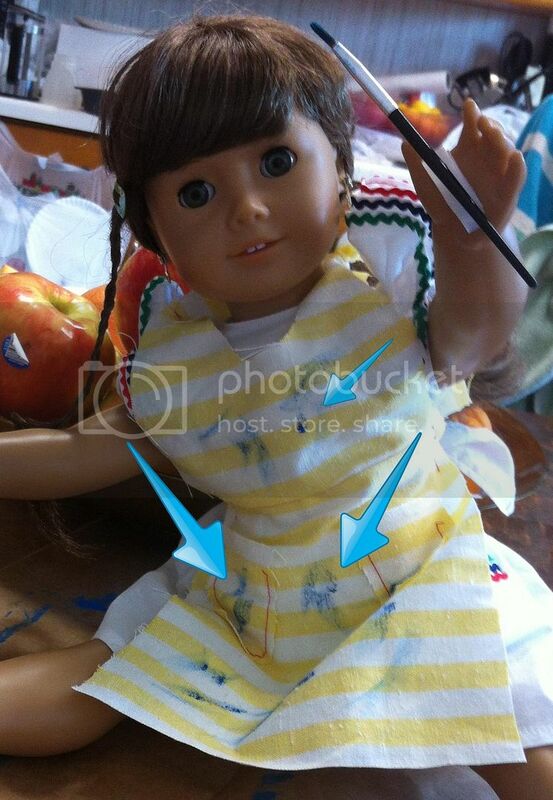 Today’s Doll Play idea is – Paint a Pumpkin! Since we don’t know how to carve, we grabbed our acrylics and got started! Oh and, I forgot to mention, you might need a pumpkin. 😉 You can find these doll-sized ones at your local farmers market, Wal-Mart, basically everywhere in October! Oh and, unless you want to get your clothes super messy, I suggest you get on an apron! After you’ve got your super duper pumpkin, apron, grab some paints and a paintbrush, and let the painting begin! Arg! Which one? Which color should I do? Hmm….eenee-meenie-miny-moe, catch a tiger by his toe. If her hollers, let him go, eenee-meenie-miny-moe! Blue won! Eeeek! I am so excited! I can’t wait to see how the pumpkins will turn out. Awww!! Isn’t she soooo cute?! I’m going to grab my yellow and paint some hair on my pumpkin. And, Madison’s brother painted a pumpkin too! Isn’t he cute? SEVEN DAYS OF DOLL PLAY! Tune in next time for another awesome play idea. Hope you enjoyed painting pumpkins! Did you get this idea from 100 days of doll play at doll diaries?